Before Mark Epstein became a medical student at Harvard and began training as a psychiatrist, he immersed himself in Buddhism through experiences with such influential Buddhist teachers as Ram Dass, Joseph Goldstein, and Jack Kornfield. The positive outlook of Buddhism and the meditative principle of living in the moment came to influence his study and practice of psychotherapy profoundly. 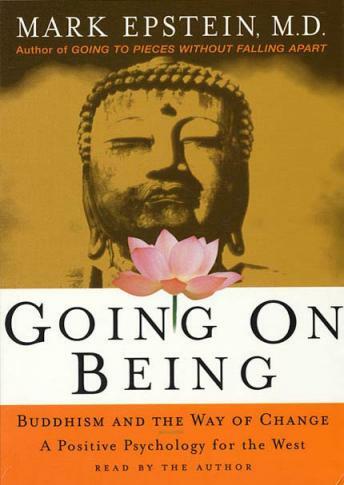 Going on Being is Epstein's memoir of his early years as a student of Buddhism and of how Buddhism shaped his approach to therapy, as well as a practical guide to how a Buddhist understanding of psychological problems makes change for the better possible. In psychotherapy, Epstein discovered a vital interpersonal parallel to meditation, but he also recognized Western psychology's tendency to focus on problems, either by attempting to eliminate them or by going into them more deeply, and how this too often results in a frustrating 'analysis of analysis.' Buddhism opened his eyes to another way of change. Drawing on his own life and stories of his patients, he illuminates the concept of 'going on being,' the capacity we all have to live in a fully aware and creative state unimpeded by constraints or expectations.